Alda was born Alphonso Joseph D'Abruzzo on January 28, 1936 in the Bronx, New York City. Alda spent his childhood with his parents travelling around the United States in support of his father's job as a performer in burlesque theatres. His father Robert Alda (born Alphonso Giuseppe Giovanni Roberto D'Abruzzo) was an actor and singer, and his mother Joan Browne was a homemaker and former beauty-pageant winner. His father was of Italian descent and his mother was of Irish ancestry. His adopted surname, "Alda", is a portmanteau of ALphonso and D'Abruzzo. When Alda was seven years old, he contracted polio. To combat the disease, his parents administered a painful treatment regimen developed by Sister Elizabeth Kenny, consisting of applying hot woollen blankets to his limbs and stretching his muscles. Alda attended Archbishop Stepinac High School in White Plains, New York. In 1956, he received his Bachelor of Arts degree in English from Fordham University in the Bronx, where he was a student staff member of its FM radio station, WFUV. Alda's half-brother, Antony Alda, born that year (1956), also became an actor. During Alda's junior year, he studied in Paris, acted in a play in Rome, and performed with his father on television in Amsterdam. In college, he was a member of the ROTC, and after graduation, he served for a year at Fort Benning, and then six months in the United States Army Reserve on a tour of duty in Korea. Alda began his career in the 1950s, as a member of the Compass Players, an improvisational, comedy revue directed by Paul Sills. He joined the acting company at the Cleveland Play House during the 1958-59 season as part of a grant from the Ford Foundation, appearing in productions such as To Dorothy A Son, Heaven Come Wednesday, Monique, and Job. In the November 1964 world premiere at the ANTA Playhouse of the stage version of The Owl and The Pussycat, he played Felix the "Owl" opposite the "Pussycat" which was played by actress/singer Diana Sands. He continued to play Felix the "Owl" for the 1964-65 Broadway season. In 1966, he starred in the musical The Apple Tree on Broadway, also starring Barbara Harris; he was nominated for the Tony Award as Best Actor in a Musical for that role. Alda says he became a Mainer in 1957 when he played at the Kennebunkport Playhouse. Alda was part of the cast, along with David Frost, Henry Morgan and Buck Henry, of the American television version of That Was The Week That Was, which ran as a series from January 10, 1964 to May 1965. He made his Hollywood acting debut as a supporting player in Gone are the Days! – a film version of the Broadway play Purlie Victorious, which co-starred Ruby Dee and her husband, Ossie Davis. Other film roles followed, such as his portrayal of author, humorist, and actor George Plimpton in the film Paper Lion (1968), as well as The Extraordinary Seaman (1969), and the occult-murder-suspense thriller The Mephisto Waltz, with actresses Jacqueline Bisset and Barbara Parkins. During this time, Alda frequently appeared as a panelist on the 1968 revival of What's My Line?. He also appeared as a panelist on I've Got a Secret during its 1972 syndication revival. In early 1972, Alda auditioned for and was selected to play the role of Hawkeye Pierce in the TV adaptation of the 1970 film MASH. He was nominated for 21 Emmy Awards, and won five. He took part in writing 19 episodes, including the 1983 2½-hour series finale Goodbye, Farewell and Amen, which was also the 32nd episode he directed. It remains the single most-watched episode of any American broadcast network television series. Alda was the only series regular to appear in all 251 episodes. Alda commuted from Los Angeles to his home in New Jersey every weekend for 11 years while starring in M*A*S*H. His wife and daughters lived in New Jersey and he did not want to move his family to Los Angeles, especially because he did not know how long the show would last. Alda's father, Robert Alda, and half-brother Antony Alda appeared together in an episode of M*A*S*H, "Lend a Hand", during season eight. Robert had previously appeared in "The Consultant" in season three. 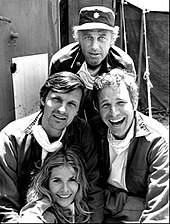 During the first five seasons of the series, the tone of M*A*S*H was largely that of a traditional "service comedy", in the vein of shows such as McHale's Navy. However, as the original writers gradually left the series, Alda gained increasing control, and by the final seasons had become a producer and creative consultant. Under his watch, M*A*S*H retained its comedic foundation, but gradually assumed a somewhat more serious tone, openly addressing political issues. As a result, the 11 years of M*A*S*H are generally split into two eras: the Larry Gelbart/Gene Reynolds "comedy" years (1972–1977), and the Alan Alda "dramatic" years (1977–1983). Alda disagreed with this assessment. In a 2016 interview he stated, "I don't like to write political messages. I don't like plays that have political messages. I do not think I am responsible for that." For the first three seasons, Alda and his co-stars Wayne Rogers and McLean Stevenson worked well together, but later, tensions increased, particularly as Alda's role grew in popularity. Rogers and Stevenson both left the show at the end of the third season. At the beginning of the fourth season, Alda and the producers decided to find a replacement actor to play the surrogate parent role formerly taken by Colonel Blake. They eventually found veteran actor and fan of the series, Harry Morgan, who starred as Colonel Sherman T. Potter, becoming another of the show's protagonists. Mike Farrell was also introduced as Alda's co-star BJ Hunnicutt. In his 1981 autobiography, Jackie Cooper (who directed several early episodes) wrote that Alda concealed a lot of hostility beneath the surface, and that the two of them barely spoke to each other by the time Cooper's directing of M*A*S*H ended. During his M*A*S*H years, Alda made several game-show appearances, most notably in The $10,000 Pyramid and as a frequent panelist on What's My Line? and To Tell the Truth. His favorite episodes of M*A*S*H are "Dear Sigmund" and "In Love and War". In 1996, Alda was ranked 41st on TV Guide's 50 Greatest TV Stars of All Time. The following is a list of M*A*S*H episodes written and/or directed by Alda. Alda's prominence in M*A*S*H provided him a platform to speak out on political topics. He has been a strong and vocal supporter of women's rights and the feminist movement. He co-chaired, with former First Lady Betty Ford, the Equal Rights Amendment Countdown campaign. In 1976, The Boston Globe dubbed him "the quintessential Honorary Woman: a feminist icon" for his activism on behalf of the Equal Rights Amendment. Alda played Nobel Prize-winning physicist Richard Feynman in the play QED, which had only one other character. Although Peter Parnell wrote the play, Alda both produced and inspired it. Alda has also appeared frequently in the films of Woody Allen, and was a guest star five times on ER, playing Dr. Kerry Weaver's mentor, Gabriel Lawrence. During the later episodes, Lawrence was revealed to be suffering from the early stages of Alzheimer's disease. Alda also had a co-starring role as Dr. Robert Gallo in the 1993 TV movie And the Band Played On. During M*A*S*H's run and continuing through the 1980s, Alda embarked on a successful career as a writer and director, with the ensemble dramedy, The Four Seasons being perhaps his most notable hit. Betsy's Wedding is his last directing credit to date. After M*A*S*H, Alda took on a series of roles that either parodied or directly contradicted his "nice guy" image. Alda has frequently appeared in his friend, Woody Allen's, films. In 1989 he appeared in Crimes and Misdemeanors with Allen and Mia Farrow. He also appeared in Manhattan Murder Mystery with Allen, Diane Keaton and Anjelica Huston. His final Allen film was in 1996 with Everyone Says I Love You reuniting with his former M*A*S*H co-star David Ogden Stiers. From the fall season of 1993 until the show ended in 2005, Alda was the host for Scientific American Frontiers, which began on PBS in 1990. In 1995, he starred as the President of the United States in Michael Moore's political satire/comedy film Canadian Bacon. Around this time, rumors circulated that Alda was considering running for the United States Senate in New Jersey, but he denied this. In 1996, Alda played Henry Ford, founder of the Ford Motor Company, in Camping With Henry and Tom, based on the book by Mark St. Germain and appeared in the comedy film, Flirting with Disaster. In 1999, Alda portrayed Dr. Gabriel Lawrence in NBC program ER for five episodes and was nominated for Primetime Emmy Award for Outstanding Guest Actor in a Drama Series. Beginning in 2004, Alda was a regular cast member on the NBC program The West Wing, portraying Republican U.S. Senator and presidential candidate Arnold Vinick, until the show's conclusion in May 2006. He made his premiere in the sixth season's eighth episode, "In The Room", and was added to the opening credits with the 13th episode, "King Corn". In August 2006, Alda won an Emmy for his portrayal of Vinick in the final season of The West Wing. Alda appeared in a total of 28 episodes during the show's sixth and seventh seasons. Alda had been a serious candidate, along with Sidney Poitier, for the role of President Josiah Bartlet before Martin Sheen was ultimately cast in the role. In 2004, Alda portrayed conservative Maine Senator Owen Brewster in Martin Scorsese's Academy Award-winning film The Aviator, in which he co-starred with Leonardo DiCaprio. Throughout his career, Alda has received 31 Emmy Award nominations and two Tony Award nominations, and has won seven People's Choice Awards, six Golden Globe Awards, and three Directors Guild of America awards. Alda received his first Academy Award nomination, for his role in The Aviator, in 2005. Alda also wrote several of the stories and poems that appeared in Marlo Thomas' television show Free to Be... You and Me. Alda starred in the original Broadway production of the play Art, which opened on March 1, 1998, at the Bernard B. Jacobs Theatre. The play won the Tony Award for Best Play. Alda also had a part in the 2000 romantic comedy What Women Want, as the CEO of the advertising firm where the main characters worked. In early 2005, Alda starred as Shelly Levene in the Tony Award-winning Broadway revival of David Mamet's Glengarry Glen Ross, for which he received a Tony Award nomination for Best Featured Actor in a Play. Throughout 2009 and 2010, he appeared in three episodes of 30 Rock as Milton Greene, the biological father of Jack Donaghy (Alec Baldwin). In January 2010, Alda hosted The Human Spark, a three-part series originally broadcast on PBS discussing the nature of human uniqueness and recent studies on the human brain. In 2011, Alda was scheduled to guest star on Law & Order: LA, portraying former police and naval officer John Winters, the father of the former main character Rex Winters. It is unknown whether he filmed his role before the series was redesigned and Rex Winters written off. After the release of his movie Tower Heist, Alda was devastated when on December 7, 2011, his decades-long friend Harry Morgan from M*A*S*H died. Alda returned to Broadway in November 2014, playing the role of Andrew Makepeace in the revival of Love Letters at the Brooks Atkinson Theater alongside Candice Bergen. In 2016, Alda appeared in Louis C.K. 's web-based series Horace and Pete as the irascible Uncle Pete in what IndieWire critic Sam Adams described as "his best role in years" in an otherwise lukewarm review. In July 2018 Alda began hosting a podcast, Clear + Vivid with Alan Alda. In 2018 Alan Alda also played the character Dr Arthur Amiot in Season 6 of Showtime's Ray Donovan. The role of is that of a psychiatrist at Grandview psychiatric hospital. During his performance the character exhibits some symptoms of Parkinson's which are shared with the show's Terry Donovan as well as Alda himself. Alda has done extensive charity work. He helped narrate a 2005 St. Jude's Children's Hospital-produced one-hour special TV show Fighting for Life. His wife, Arlene, and he are also close friends of Marlo Thomas, who is very active in fund-raising for the hospital that her father, Danny Thomas founded. The television special featured Ben Bowen as one of six patients being treated for childhood cancer at Saint Jude. Alda and Marlo Thomas had also worked together in the early 1970s on a critically acclaimed children's album entitled Free to Be You and Me, which featured Alda, Thomas, and a number of other well-known character actors. This project remains one of the earliest public signs of his support of women's rights. In 2005, Alda published his first round of memoirs, Never Have Your Dog Stuffed: and Other Things I've Learned. Among other stories, he recalls his intestines becoming strangulated while on location in La Serena, Chile, for his PBS show Scientific American Frontiers, during which he mildly surprised a young doctor with his understanding of medical procedures, which he had learned from M*A*S*H. He also talks about his mother's battle with schizophrenia. The title comes from an incident in his childhood, when Alda was distraught about his dog dying and his well-meaning father had the animal stuffed. Alda was horrified by the results, and took from this that sometimes we have to accept things as they are, rather than desperately and fruitlessly trying to change them. In 2006, Alda contributed his voice to a part in the audio book of Max Brooks' World War Z. In this book, he voiced Arthur Sinclair, Jr., the director of the United States government's fictional Department of Strategic Resources (DeStRes). His second memoir, Things I Overheard While Talking to Myself, weaves together advice from public speeches he has given with personal recollections about his life and beliefs. For 14 years, he served as the host of Scientific American Frontiers, a television show that explored cutting-edge advances in science and technology. He is[when?] a visiting professor at Stony Brook University and a founder and member of the advisory board of the university's Alan Alda Center for Communicating Science  and the Future of Life Institute. He serves on the board of the World Science Festival and is a judge for Math-O-Vision. Alda also has an avid interest in cosmology, and participated in BBC coverage of the opening of the Large Hadron Collider, at CERN, Geneva, in September 2008. After years of interviews, Alda helped inspire the creation of the Alan Alda Center for Communicating Science at Stony Brook University in 2009. He remains on the advisory board as of 2013[update]. He was named an Honorary Fellow by the Society for Technical Communication in 2014 for his work with the Center for Communicating Science and the annual Flame Challenge. He is also on the advisory board of the Future of Life Institute. Alda would like to use his expertise in acting and communication to help scientists communicate more effectively to the public. In 2014 Alda was awarded the American Chemical Society's James T. Grady-James H. Stack Award for Interpreting Chemistry for the Public for his work in science communication. He was awarded the National Academy of Sciences Public Welfare Medal in 2016 "for his extraordinary application of the skills honed as an actor to communicating science on television and stage, and by teaching scientists innovative techniques that allow them to tell their stories to the public." In 1956, while attending Fordham, Alda met Arlene Weiss, who was attending Hunter College. They bonded at a mutual friend's dinner party; when a rum cake accidentally fell onto the kitchen floor, they were the only two guests who did not hesitate to eat it. A year after his graduation, on March 15, they were married. They have three daughters: Eve, Elizabeth, and Beatrice. Two of his eight grandchildren are aspiring actors. In an intimate interview, Alda revealed that Arlene sometimes will call him "Fonzi" in reference to his birth name "Alphonso". The Aldas have been long-time residents of Leonia, New Jersey. Alda frequented Sol & Sol Deli on Palisade Avenue in the nearby town of Englewood, New Jersey—a fact mirrored in his character's daydream about eating whitefish from the establishment in an episode of M*A*S*H in which Hawkeye sustains a head injury. In Things I Overheard While Talking to Myself, Alda describes how as a teen he was raised as a Roman Catholic and eventually he realized he had begun thinking like an agnostic or atheist. While he admits to still praying on occasion, he said he wants to find meaning in this life rather than worrying about the next one. While he still talks to God on occasion, he admits it often comes at times of fear rather than out of a sense of belief. Furthermore, he doesn't like to be labeled as an "agnostic," stating it's too fancy a word for him in an interview for the 2008 question section of the Edge Foundation website. He argues he simply isn't a believer and questions why people are so frightened of others who hold beliefs different than their own. On July 31, 2018, he appeared on CBS This Morning and announced he had been diagnosed with Parkinson's disease three years prior. Emmy Award for Outstanding Writing in a Comedy or Comedy-Variety or Music Series in 1979 for M*A*S*H: "Inga"
Emmy Award for Outstanding Directing for a Comedy Series in 1977 for M*A*S*H: "Dear Sigmund"
Directors Guild of America Award for Outstanding Directorial – Comedy Series in 1983 for M*A*S*H "Where There's a Will, There's a War"
Directors Guild of America Award for Outstanding Directorial – Comedy Series in 1982 for M*A*S*H: "The Life You Save"
Directors Guild of America Award for Outstanding Directorial – Comedy Series in 1977 for M*A*S*H: "Dear Sigmund"
In 1998 the Committee for Skeptical Inquiry (CSICOP) episode "Beyond Science" hosted by Alda was singled out by the Council for Media Integrity concerned with the "balanced portrayal of science" and to "reward sound science television programming". Screen Actors Guild Lifetime Achievement Award in 2019. Academy Award (Best Supporting Actor) for his role as Senator Ralph Owen Brewster in Martin Scorsese's film The Aviator. 1958 The Phil Silvers Show Carlyle Thomson III Episode: "Bilko the Art Lover"
1962 Naked City Young Poet Episode: "Hold for Gloria Christmas"
1963 The Doctors and the Nurses Dr. John Griffin Episodes: "Many a Sullivan", "Night Sounds"
1963 Route 66 Dr. Glazer Episode: "Soda Pop and Paper Flags"
1963 East Side/West Side Freddie Wilcox Episode: "The Sinner"
1965 The Trials of O'Brien Nick Staphos Episode: "Picture Me a Murder"
1967 Coronet Blue Clay Breznia Episode: "Six Months to Mars"
1968 Premiere Frank St. John Episode: "Higher and Higher, Attorneys at Law"
1974 The Carol Burnett Show Himself Episode: "#8.13"
2005 Getaway Himself Episode: "Found"
2009–10 30 Rock Milton Greene Episodes: "Mamma Mia", "Kidney Now! ", "Christmas Attack Zone"
2016 Broad City Dr. Jay Heller Episode: "2016"
2018 The Good Fight Solomon Waltzer Episodes: "Day 457", "Day 471"
2018-19 Ray Donovan Dr. Arthur Amiot Episodes: "Dream On", "The Dead"
Alda, Alan (2006). Never Have Your Dog Stuffed. London: Hutchinson. ISBN 978-0-09-179652-5. OCLC 64931144. — (2007). Things I Overheard While Talking to Myself. New York: Random House. ISBN 978-1-4000-6617-9. OCLC 122309367. — (2017). If I Understood You, Would I Have This Look on My Face?. New York: Random House. ISBN 978-0812989144. OCLC 970641564. ^ Twomey, Bill (June 24, 2016). "Fordham graduate known for award-winning MASH role". Bronx Times Reporter. ^ Alan Alda, interviewed by Jian Ghomeshi, CBC Radio, March 28, 2013. In response to Ghomeshi's comment that Alda had grown up in the Bronx, Alda said, "No I didn't but I can tell you're a Wikipedia reader." ^ Alda, Alan. "Alan Alda TV Legends Interview, Part I (13:25-14:30)". Archive of American Television. Academy of Television Arts and Sciences Foundation. Retrieved February 17, 2014. ^ Berk, Philip (December 11, 1998). "A question of roots". The Jerusalem Post. Archived from the original on November 5, 2012. Retrieved December 10, 2007. ^ Smiley, Tavis (December 2, 2004). "Alan Alda". PBS. Archived from the original on September 29, 2007. Retrieved May 2, 2007. ^ Delach, Brian (May 6, 2013). "Alan Alda Gets Personal About Life After MASH". NBC Connecticut. ^ "Military People: Alan Alda". militaryhub.com. After graduation, Alda joined the U.S. Army Reserve and served a six-month tour of duty in Korea. ^ Oldenburg, Chloe (1985). Leaps of Faith: History of the Cleveland Play House, 1915-85. Cleveland. p. 85,87. ^ Nancy (June 6, 2014). "Strange bedfellows". 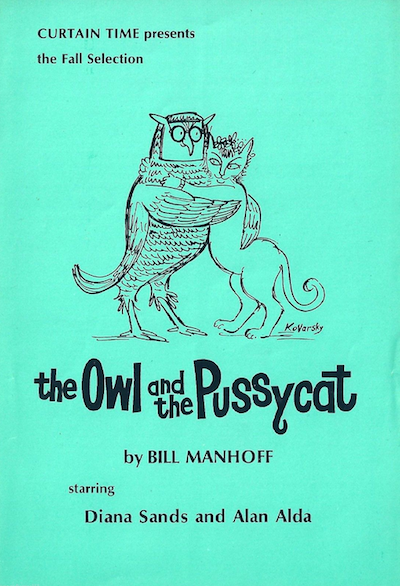 ^ "The Owl and the Pussycat 1964 fall selection playbill cover". ^ Alan Alda, interviewed by Diane Russell, Portland Magazine, Feb/March 2014. "Alda Ego"
^ "Hawkeye Trivia and Quotes". Tv.com. Archived from the original on February 4, 2013. Retrieved May 17, 2011. ^ a b Alda, Alan (2006). Never Have Your Dog Stuffed: and Other Things I've Learned. New York: Random House. ISBN 1-4000-6409-0. ^ Maron, Marc. "WTF Podcast #735 – Alan Alda". WTFPOD.com. WTF Podcast. Retrieved August 30, 2016. ^ "Mclean Stevenson, 'Mash' Star". The Seattle Times. February 17, 1996. ^ Stassel, Stephanie (December 7, 2011). "Harry Morgan dies at 96; star of TV's 'MASH'". Los Angeles Times. ^ Hoffman, Jordan (October 15, 2015). "Alan Alda Knows His Feminist History". Vanity Fair. Retrieved January 7, 2018. ^ "Alda, Alan: U.S. Actor". The Museum of Broadcast Communications. ^ a b c "Alan Alda, on season 4". Scientific American Frontiers. Chedd-Angier Production Company. 1993–1994. PBS. Archived from the original on 2006. ^ "Alan Alda | Television Academy". Television Academy. Retrieved May 31, 2018. ^ "Harry Morgan, 1915-2011: Actor most remembered as Col. Potter of 'M*A*S*H'". The Toledo Blade. December 8, 2011. Retrieved April 3, 2014. ^ "Candice Bergen & Alan Alda Step into A.R. Gurney's Love Letters on Broadway". ^ Craighead, Olivia (July 10, 2018). "Alan Alda thinks we could all be better listeners". The Fader. Retrieved July 28, 2018. ^ Alda, Alan. Things I Overheard While Talking to Myself. https://www.amazon.com/Things-Overheard-While-Talking-Myself/dp/0812977521: Random House Trade Paperbacks - New York. ISBN 978-0-8129-7752-3. ^ "Alan Alda Joins SOJ Faculty". December 14, 2010. SUNY Stony Brook School of Journalism. Retrieved March 4, 2012. ^ "Big Bang Day: Physics Rocks". BBC Web Site. September 10, 2008. Archived from the original on September 10, 2008. Retrieved September 10, 2008. ^ "Advisory Board: Alan Alda". November 17, 2010. Center For Communicating Science. Archived from the original on December 7, 2013. Retrieved December 3, 2013. ^ "Alan Alda Named STC Honorary Fellow". Retrieved April 16, 2014. ^ "Discovering a Common Language with Alan Alda | The New York Academy of Sciences". www.nyas.org. Retrieved November 22, 2015. ^ "Alan Alda receives James T. Grady-James H. Stack Award for Interpreting Chemistry | Alan Alda Center for Communicating Science®". www.centerforcommunicatingscience.org. Archived from the original on February 12, 2017. Retrieved October 9, 2016. ^ Brady, Lois Smith (February 13, 2015). "State of the Unions: There's Always Room for Rum Cake". The New York Times. Retrieved March 12, 2015. ^ Kolbert, Elizabeth (May 18, 1994). "At Lunch With: Alan Alda; Hawkeye Turns Mean, Sensitively". The New York Times. Retrieved November 24, 2007. Ever since M*A*S*H, Alda has split his time between the East Coast, where he has houses in the Hamptons and Leonia, New Jersey, and the West, where he owns a home in the Bel Air section of Los Angeles. ^ Kingergan, Ashley (September 27, 2010). "Noted Englewood deli closes after 60-plus years". The Record. Archived from the original on September 22, 2012. Retrieved September 27, 2010. Perhaps the greatest tribute to the deli came from the 1970s television show M*A*S*H. Hawkeye, one of the main characters in M*A*S*H*, daydreams about whitefish from Sol & Sol after sustaining a head injury. ^ a b Alda, Alan (September 4, 2007). Things I Overheard While Talking to Myself. Random House Publishing Group. ISBN 9781588366481. ^ a b "THE WORLD QUESTION CENTER 2008 – page 8". Edge Foundation Web Site. 2008. Retrieved January 2, 2008. ^ "Alan Alda reveals he has Parkinson's disease". CBS News / CBS This Morning. July 31, 2018. Retrieved July 31, 2018. ^ "Alan Alda" (PDF). Retrieved February 28, 2014. ^ "2005-06 Primetime Emmy Awards Nominations Announced". Retrieved February 28, 2014. ^ "Book of Members, 1780–2010: Chapter A" (PDF). American Academy of Arts and Sciences. Archived (PDF) from the original on May 10, 2011. Retrieved April 14, 2011. ^ "Alan Alda To Give Keynote Address At Carnegie Mellon, May 17". www.cmu.edu. ^ "The Latest: Alan Alda gets SAG lifetime achievement award". AP NEWS. January 28, 2019. Retrieved January 28, 2019. ^ "Honorary Degree Recipients". saintpeters.edu. Saint Peter's University. Retrieved July 4, 2017. ^ "Drew University". Drew University. Retrieved May 31, 2018. ^ "Past Honorary Degree Recipients, Reunion & Commencement - Wesleyan University". www.wesleyan.edu. Retrieved May 31, 2018. ^ "Roll out the honours - Education News - theage.com.au". www.theage.com.au. Retrieved May 31, 2018. ^ Walters, Ken (April 23, 2015). "Alan Alda to Give Keynote Address at Carnegie Mellon Commencement, May 17". cmu.edu. Carnegie Mellon University News. Retrieved July 4, 2017. ^ Hill, Grant (May 19, 2017). "University to honour leading international figures". dundee.ac.uk. University of Dundee. Retrieved July 4, 2015. 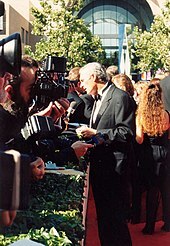 Wikimedia Commons has media related to Alan Alda.